The world’s fastest transfer speeds.. 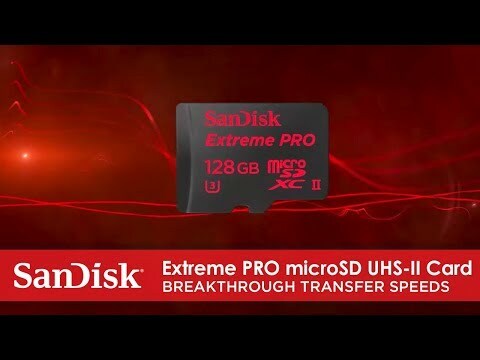 The SanDisk Extreme PRO microSDXC UHS-II Card delivers transfer speeds of up to 275MB/s** so you can get to your videos faster than ever before. Use the included USB 3.0 reader for convenient transfers and take the bottleneck out of enjoying even your most massive 4K UHD video files2. Finally your memory card can keep up with you and your lifestyle! From a leader in flash memory storage, this card is ideal for offloading 4K UHD video2 from your action camera, drone, high-performance camera or smartphone. Clocking in at up to 275MB/s**, the SanDisk Extreme PRO microSDXC UHS-II Card delivers the fastest transfer speeds that you’ve ever experienced. So offloading content from your card is a snap. And the time you would have spent waiting for files to transfer goes back into your day. ** Up to 275MB/s read; up to 100MB/s write. Based on internal testing; performance may be lower depending upon host device interface, usage conditions and other factors. 1MB=1,000,000 bytes. 1. UHS Speed Class 3 designates a performance option designed to support real time video recording with enabled UHS host devices. 3. Backwards-compatible with UHS-I host devices, performing up to UHS-I speeds allowed by the host device.